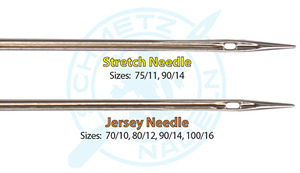 What's the Difference Between a SCHMETZ Stretch Needle and a Jersey Needle? 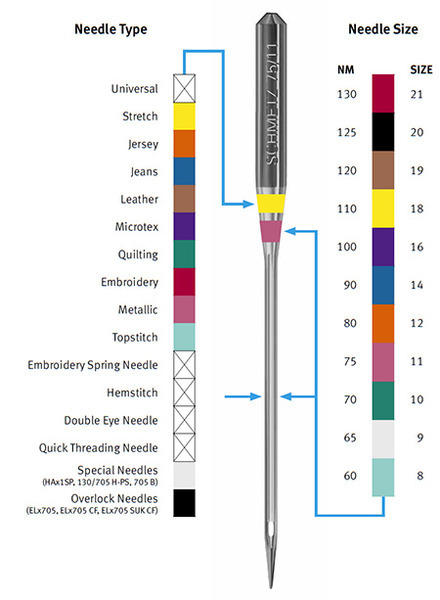 ~A Stretch Needle has a shorter and narrower eye compared to a Jersey needle. ~The Stretch Needle scarf (that little indentation on the back side of the needle above the eye) is deeper. ~Both needles have a medium ballpoint. Use the SCHMETZ Stretch needle on elastic or highly elastic fabrics. Start with a Stretch Needle if the fabric blend includes or Spandex. If the stitch quality is not to your liking, then switch to the Jersey with elongated eye.